We’ve recently welcomed a new member into the Like an Egg team! We’ve including this post to allow our readers and customers to become acquainted with our newest editor, Atlanta. Firstly, I’d like to apologize for this photo, I tried my hardest to find a photo that looked professional, wasn’t a selfie and didn’t look completely ridiculous. However, I came to the realization that I’ve spent the last 3 years of my life downing shots in fancy dress, rolling around in a field or standing vainly in the front camera of my phone so I decided to just embrace the reality and show you the most accurate representation, whilst still trying to remain professional, of myself. 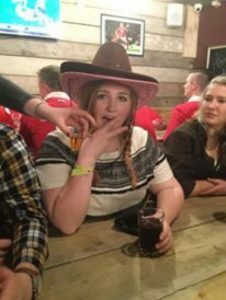 Here I am, at the end of the second night of our annual 7s tournament dressed as a Native American that somehow stole two of the guys’ cowboy hats, and yes I am also being a handed a shot in this photo, don’t ask me about my liver, it’s long gone. Secondly, yes my name is actually Atlanta despite much disbelief over the last 21 years. Most people ask how I would shorten the name, I tend to go by Lant or Lanta, some even just resort to referring to me by my surname, which is an even stranger name than Atlanta. It’s Swannack incase you were wondering, it’s led to many mispronunciations and misspelling and some rather elaborate nicknames over the years I must admit. You can imagine having to tell people over the phone that my name is Atlanta Swannack is difficult especially when you have a thick valleys accent! Anyway, enough about the name, let’s move on to some interesting information about me! 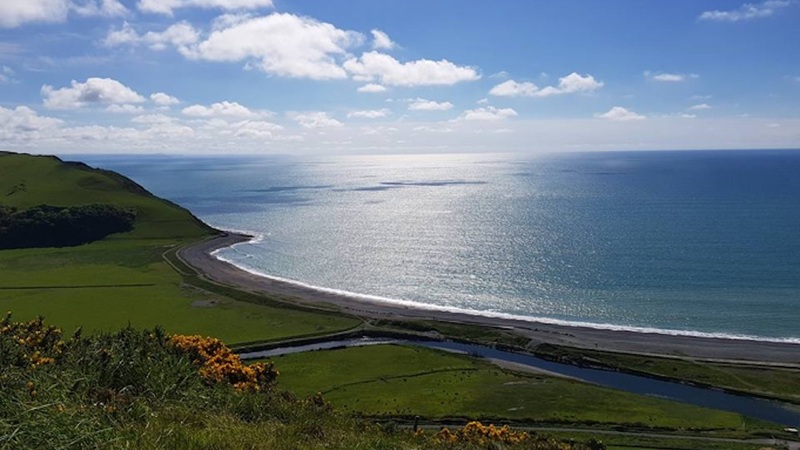 I’ve recently finished my 3rd and final year at Aberystwyth University studying Film and Television studies, I’ll be graduating in July with a 2:1 Class Honors in Astudiaethau Ffilm a Theledu. (Film and Television Studies in Welsh) I studied the course bilingually even though it was supposed to be an entirely Welsh language degree, however there aren’t anywhere near enough module options through the Welsh language in such a modern industry! If you’ve never been to, or heard of, Aberystwyth, I would highly suggest you add it to your bucket list. It’s a beautiful little coastal town hidden in West Wales, and while there aren’t hundreds of activities to do, it is one of the best places I have ever had the pleasure of visiting. I promise it wasn’t because it has over 50 licensed premises in a town so small you could walk from one end to the other in half an hour! If by any chance you’re thinking of going to University or even looking for a mini break I could not stress enough how much you would fall in love with the place. It was during University that I discovered my one true love, rugby. I joined the team in my second year and it was easily one of the best decisions I have made! Since then I have discovered a love and a passion for the sport and I’m itching to join a team locally now that I’ve moved back to the paradise that is the Rhondda Valleys. This was also one of the main reasons I ever got introduced to Like An Egg, but more about that later! I’m not sure what else to include about myself without it sounding like I’m pitching a dating profile via a blog so we’ll leave it at that where we can envision me as some weirdly named, recently graduated rugby player/editor who is in love with some 2×2 town in west Wales. My interest in the industry was firmly planted by my Media Studies teacher during GCSE’s, I’d chosen the subject because it seemed like a cool and easy topic, little did I know I would actually end up loving the subject more than any other and trying to recruit other students into choosing it for A-Levels so that we could continue the subject. I definitely did not think that 7 years later, after ticking that little box to study Media, I’d be sat in an office writing a blog about how I’ve recently joined a productions team as an editor. Being an editor has not always been my goal, in fact 3 years ago I’m pretty sure I still wanted to be a teacher. I’m not sure why I ever thought that was a good idea, I cannot picture me ever being a teacher now! In fact, the thought of being an editor didn’t cross my mind until I did my work experience with Like An Egg at the end of my 2nd year. I’d decided that year that I was definitely interested in working within the industry but I had absolutely no idea what it was I wanted to do, like zero idea at all. This came as more of a surprise than when I initially decided that Film and TV was what I wanted to do in University, and that came as last minute as it could since I decided to change my course 2 weeks into the first semester. I’d always been interested in teaching so to completely steer my career choice threw me to say the least. Luckily, I was enrolled onto a module that required you to go into work placement within the industry. This is when I was introduced to Like An Egg. A previous client of theirs had been a family friend for as long as I could remember. I was mid filming him for a project about Women’s Rugby for Uni and happened to mention I needed a placement, and that’s when he suggested Like An Egg. After my initial week with them, I decided editing was definitely something I wanted to do, I enjoyed even the smallest of tasks, and they excited me enough that you would swear that I’d been offered the role of an editor on some blockbuster film. I’d like to think I’m still as excited about the work, it’s only been two weeks but I’ve most definitely enjoyed it. I was initially nervous about moving home from Uni and going straight into a new job and home and generally hitting the ground on the path to adulthood running. But the guys at Like An Egg have made it a significantly easier transition and I’m already enjoying it more than I thought I could! I look forward to the future and hopefully, with their help, I can become an amazing editor and then disappear to Canada or New Zealand!